Man, last night was awesome and I’m once again convinced that Nashville has some of the greatest shows around. Seeing Carl Broemel and The Greenhornes in a packed, sweaty club is not a bad way to spend a Wednesday night. While I would've enjoyed an earlier start time, that's a small price to pay compared to the incredible show both bands put on. The Basement is one of my favorite venues and I’ve yet to see a bad show there. Occupying a small space underneath Grimey’s, The Basement houses a stage and a bar and you can see the band from pretty much anywhere. It can hold about 150-200 people and all of them were there last night! The Basement is notorious for a few things; heat, b.o., chatty cathies and killer bands. All elements were in full force last night. 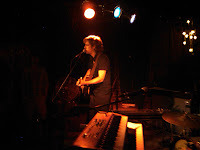 Celebrating the release of his new album, All Birds Say, Carl Broemel took the stage a little after nine. Backed by an acoustic guitar, bass, keys and drums, Carl switched between electric, acoustic and pedal steel for his 18 song set. His low key, alt-country tunes eased from the stage and sounded incredible in this setting. He started off with a beautiful rendition of my favorite song from All Birds Say¸ “Carried Away,” and proceeded to play every song off the album and quite a few more. Most songs were with his band, but he still played a few by himself. One thing that blew me away about Carl’s playing is his incredibly smooth tones and his intricate chord formations. Seriously, this guy is like a Mel Bay instructional book on steroids. He also doesn't let the limitation of only having two hands mess with him, as he used foot pedals to record and playback live vocal and guitar loops to build lush, swirling accompaniments. These weren't pre-recorded tracks or anything. He'd play the guitar or sing a vocal while recording it, play it back while playing or singing something new and continue layering the sounds easily and organically, without them ever clashing with each other. For a couple songs, Carl would switch instruments mid-song to play a pedal steel solo or add some electric guitar elements. In one dazzling display during a solo song, he started with a vocal loop, recorded some electric textures, added a "bass line" from his guitar, laid down his electric to switch over to the pedal steel where he played a killer solo and recorded another loop, then finished things off by playing with the tremolo and reverb effects on his amp. It was not only impressive to say the least, it was musical and gorgeous and not the least bit overblown. No matter if he was playing multiple instruments over loops or just singing with an acoustic, he approached each song with a laid-back, come what may vibe. I hope he can find time for more of these solo shows and solo albums because his brand of musicality and lyrical philosophizing has me hooked. While I'm sure Carl gained some new fans and hopefully sold some copies of his new album, the night belonged to The Greenhornes. With them not having played a live show for close to five years, the anticipation in the room was genuinely palpable. They started the night off with "Can't Stand It" from their second album and immediately let everyone know they hadn't gotten rusty or soft during the hiatus. From the first note, the crowd was engaged, singing and dancing along to every song. Patrick and Jack were having fun, playing hard and letting loose, while lead singer/guitarist Craig Fox let his playing convey his emotional output. If you were to just look at his face, you'd think he'd rather be anywhere else but on stage, but his vocal output and playing approach beg to differ. All three guys are genuinely skilled at their instruments and know how to harness the energy and spirit of the 60's psychedelic, garage rock movement into a raw, powerful party. They whipped out songs from their back catalog and debuted a few new songs that will appear on their new album coming out in October. The crowd literally tripled in size before The Greenhornes started playing and most of them seemed genuinely into the show and pumped about the music. There was a noticeable drop in the level of conversations during their set and I really think that the power displayed in their music commanded the attention. 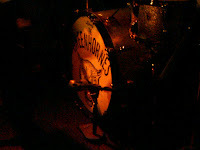 It's exciting and refreshing to see the unrestrained, unpolished side of rock music and if you're lucky enough to have The Greenhornes visit your town, you'd be crazy to miss out on the chance to experience it yourself.